The Willoughby HB-Series Hose Box is a recessed, stainless steel utility fixture for use in commercial, healthcare, and other environments requiring vandal-resistant plumbing access. HB-Series hose boxes are fabricated from Type 304 stainless steel, polished to a #4 satin finish. Standard hose boxes will include 1/2” nominal brass fittings, inlet screwdriver stops, 1/2” F.I.P. inlets, and 3/4” M.G.H.T. outlets. HB-Series fixtures are available in Dual or Single Temperature; with or without Door; with or without Vacuum Breaker; and with or without Waste Outlet. All plumbing supply connections are made behind the recessed wall box, with anchoring points for the wall box and the flush-mounted flange located inside the box perimeter (anchoring hardware by others). 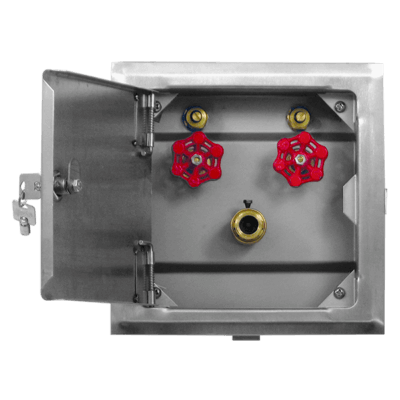 The Willoughby HBBD-Series Boiler Drain Valve Hose Box is a recessed, stainless steel utility fixture for use in commercial, healthcare, and other environments requiring vandal-resistant drain valve access. HBBD-Series hose boxes are fabricated from Type 304 stainless steel, polished to a #4 satin finish. 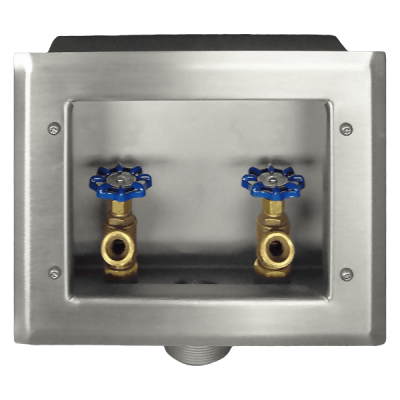 Standard boiler drain valve boxes will include 1/2” nominal brass boiler drain valves, 2” M.I.P. drain, 1/2” F.I.P. inlets, and 3/4” M.G.H.T. outlets. HBBD-Series fixtures are available in Dual or Single Temperature. All plumbing connections are made behind or within the recessed wall box, with anchoring points for the wall box and the flush-mounted flange located inside the box perimeter (anchoring hardware by others).